Meet Markus, an android who fights to convince humanity that androids are more than just machines. 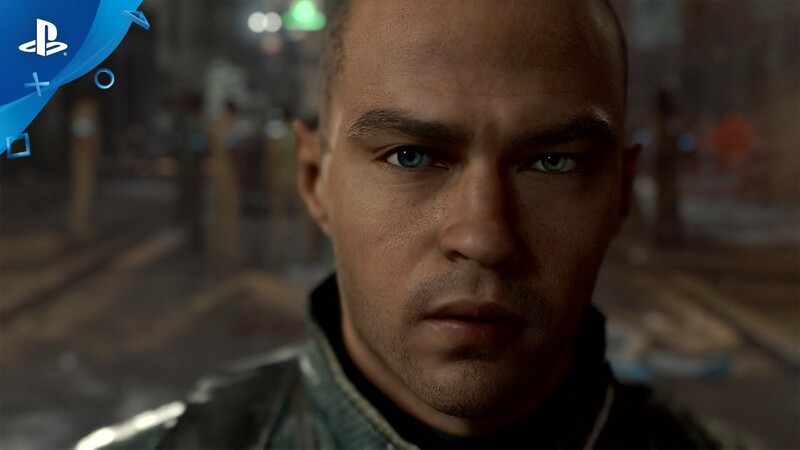 After reintroducing the character of Kara at Paris Games Week two years ago, and revealing Connor in our first gameplay footage at E3 2016, we are thrilled to return to E3 for the unveiling of our third and final playable character: Markus. Until now, humans have never considered these machines as anything more than tools designed to obey orders. But some of them are starting to exhibit strange behavior, as if they were experiencing emotions. The story of Detroit follows three of these so-called “deviants” as they begin to question their place in society, and desire freedom. 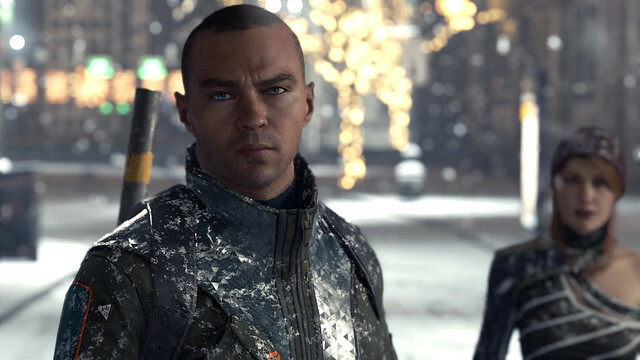 Markus (played by Jesse Williams) is an android who escaped his master and joined a small group of deviants hiding underground in Detroit. Lost and disparaged, they will try to find ways of convincing humanity that they are more than just defective machines – that they are alive. 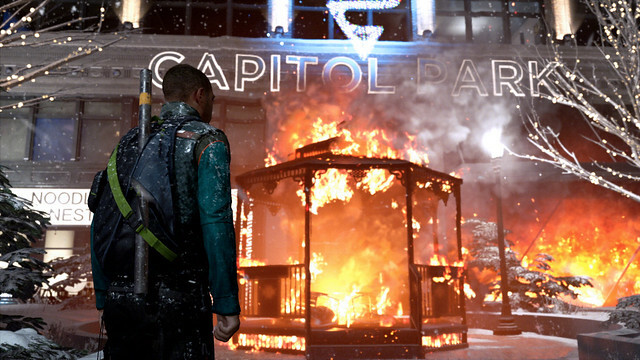 In the new scene we’ve revealed at E3, Markus executes a covert operation during a cold Detroit night, with the aim of freeing androids that are for sale in a store. If he succeeds, Markus will have the opportunity to send a strong message to humans. Will you manage to liberate your android brethren, or will you refuse to risk the life of their revolutionary leader? Will you send a message of pacifist disruption, or exercise revolutionary defiance? How will you navigate the dilemmas of leadership and wield your power? In addition to Connor’s “Hostage” scene shown last year (playable at E3 this year on the show floor for the first time), we wanted to demonstrate again how branching Detroit really is. We also introduce for the first time a selection of new gameplay mechanics, which will allow players to experience the unique capabilities of androids as they create their story. 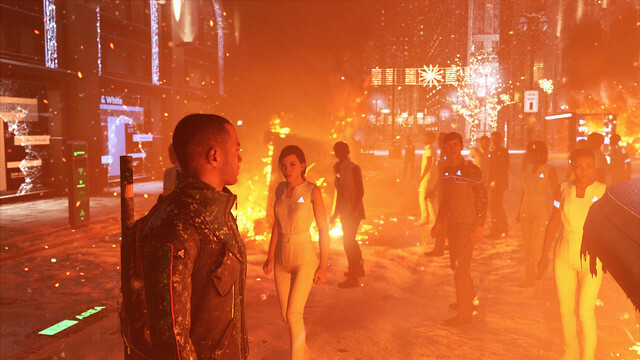 Both scenes also display the latest iteration of Detroit’s powerful engine and impressive technology. Each scene runs in dynamic 4K HDR on PS4 Pro* and includes crowd management, special FX, full performance capture, and many other features that will make the world of Detroit more vivid and immersive for the players. Kara, Connor, Markus – three androids discovering what it means to feel emotion – will take you on a moving journey of doubts, fear, hope and redemption. You will follow them as they struggle for freedom, you will join them in the fight to survive as the world collapses around them, and you will guide them through heart-wrenching dilemmas that put their lives – and the lives of those they care about – on the line. With Detroit: Become Human, Quantic Dream presents the most ambitious interactive drama ever created by the studio. We hope to make it a unique experience that will resonate with our players and make us think about what it really means to be human. Mr. Cage this is one of my most anticipated exclusives coming to PS4. Heavy Rain was one of my favourite games on PS3 (honestly haven’t played your other games yet), but as soon as the release date is announced (2018 seems likely ;) ) I’ll be all over it. Do they wear different clothings on different days? QD has yet to disappoint me. This looks incredible. It’s interesting that three main controllable characters are all androids, I would have expected one human, so it will be interesting to see how this all serves the story. So we can expect this is 2018, right? Nice been lookin forward to Detroit since last E3,Quantic Dream never disappoints.Been following Kara since the tech demo and she’s cool but still think Connor will be the coolest to play as…that Markus dude though he is dumb but it’ll be nice to play as 3 characters.Nicely done Quantic Dream,game looks gorgeous too as expected. PS:Y’all need to quit this “coming to PS4 and PS4 pro” thing…PS4 is a single thing,don’t try to split it.It’s plain obvious that every Sony game from now on will have pro features. Androids are built to serve HUMANITY, they are not born naturally into this world, they were created to serve us so they have NO RIGHTS.